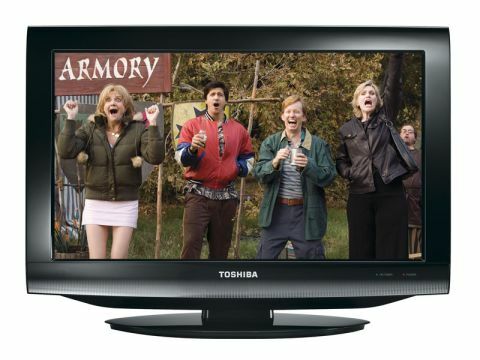 The designers at Toshiba have put their thinking caps on and decided that a bedroom TV needs two things – a DVD player and USB media playback. Compare its cost with rivals and you'll find that the DVD player commands no premium, while Toshiba's addition of DivX playback for USB sticks is excellent news. What's slightly less appealing is the 19DV714B's depth, which measures 73mm – this is one chunky LCD TV. A tight viewing angle sees contrast and colour drain when watched from the wings. Insert a DVD and it defaults to immediate playback, with considerable motion blur, though the easy all-in-one remote and DVD system will be difficult to ignore for some. The 19DV714B's generous bulk does have its advantages. Build quality is a significant draw, with the whole package feeling solid and stable, with its attached desktop stand snapping into place from a folding position on the rear – though that does mean it can't be wall-mounted (though at this bulk, you won't want to). The EPG shows two hours of schedules for eight channels, and though it floats over the channel you're watching, it's not the best design; the grey, yellow and pale grey graphics are a tad old-fashioned. It's a similar story for USB playback, the menus for which are only activated by inserting a memory stick, which leaves you with no way of accessing content (just MP3 and JPEG) if a stick is already in place. Connections include a couple of HDMI inputs (one on the side) and a Common Interface slot, and though Freeview pictures and DVD are watchable, there's a distinct lack of clarity and class. The remote, too, is excellent; coloured white to match the TV, it forms an important part of this self-sufficient product with a combination of good-sized buttons and a reasonably easy to use design, though the dual-function labelling might trouble some users. Unfortunately, the extra bulk has no bearing on the audio, with weedy 3W speakers specified where there ought to have been room for a semi-serious sound system. In effect the DVD player is present instead of a LED-backlit LCD panel, which proves its downfall, in some ways. It may be hard to resist this good value set's features, though the 19DV714B is more workhorse than wallflower.